There is a incredible wave of anticipation for Sheffield Wednesday as the summer begins to heat up. Dejphon Chansiri’s target of Premier League football within two years suggests the Owls will be busy in the transfer market over the next two and a half months. Things could have been so different for the club had the events of exactly a year ago today panned out as planned. A new era was promised just then, as it was when Chansiri’s takeover was first announced in January. On June 10, 2014, Milan Mandaric declared he had finally found the buyer for Wednesday he had been looking for - an Azerbaijani businessman named Hafiz Mammadov. “I am delighted to have concluded a deal with Hafiz,” Mandaric said. 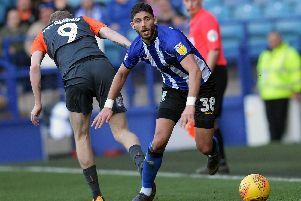 “He is a true football man and I have no doubt whatsoever that I am handing over control to someone with a real passion for the game and the ability to carry on the work I started three years ago to return Sheffield Wednesday back to the top division of English football. Mammadov certainly came with football experience, having owned FC Baku in his homeland and RC Lens in France - newly promoted to Ligue 1 at the time - as well as buying a significant shareholding in Atletico Madrid. There was also the promise of great wealth with the 50-year-old boasting a wealth of several hundred million pounds as founder and chairman of the Baghlan Group which specialises in oil, gas, construction and transportation and had close ties with the Azerbaijani government. Though there were some questions about Mammadov’s business dealings and human rights issues in Azerbaijan, there seemed to be little doubt over the deal he had done with Mandaric. But it did not take long for the doubts to begin to creep in. First came issues with Lens and the French football authorities chasing funds promised by Mammadov to the club in the annual budget. This would eventually lead Lens to be automatically relegated to Ligue 2 at the end of last season as the funds failed to materialise. Then there was the long and arduous wait for the deal to be ratified by the Football League, who are frustratingly tight-lipped on such matters. It was not until three months after the original announcement that Mandaric finally declared he had lost patience and called the deal off. Mammadov had failed to raise the funds leaving Mandaric back to square one and saddled with the Azerbaijan Land of Fire shirt sponsorship that had not been paid for. Though there was frustration at another false dawn, subsequent events suggest missing out on Mammadov was one of the best things that could have happened to the Owls. Such has Mammadov’s reputation been decimated across the Channel that he is now the subject of parody videos and comedic sets, though few people associated with Lens are laughing. Lens have been left in a position where they need to find 15 million euros in order to avoid a potential immediate relegation from Ligue 2. The club’s president is mounting a desperate search for new investment in order to push Mammadov out once and for all. And he has left his hometown club Baku high and dry also with the Azerbaijani Football Federation stripping them of their license due to severe financial difficulties and the lack of guarantees for the coming season. Baku have been relegated to the second division. Mammadov is reportedly the subject of an warrant in Azerbaijan over embezzlement of funds and was forced to deny he had fled the country in order to avoid arrest. Though there are plenty of questions still to be answered about the intentions of the man who stepped into the breach for Wednesday when Mammadov failed to step up, one thing is for certain. The Owls are in a much better position than they probably would have been had Mammadov managed to raise the £40m for the club he had originally promised.